It all began with a group of concerned parents from the Benjamin Region who needed help with their special-needs children. The Benjamin Region, just north of Jerusalem, is composed of 42 small Jewish communities, spread across a large rural area and with a collective population of some 25,000. As the number of children with special needs grew, it became virtually impossible for any one small community to provide adequate programming for these children. Until Heart of Benjamin came along! 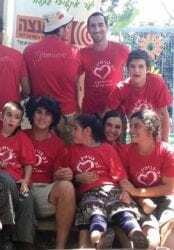 Heart of Benjamin provides educational and recreational activities for 200 children from all over the Benjamin Region suffering from chronic and genetic diseases, brain damage and paralysis, and a host of other physical, educational and social challenges. The program operates after school hours, on weekends and during holidays, when parents are juggling work and attention to their other children with the enormous demands of their special-needs children. Many of the Heart of Benjamin children require constant care, while others are more independent, but their overall development and well being depend upon their receiving appropriate stimulation throughout the day. The children come directly from school, and after a hot lunch, they’re offered a wide variety of activities which include professional therapy, and group activities like horseback riding, photo therapy, art, therapeutic gardening, and more. Local high school students volunteer to work with the children and complement the professional staff of recreational therapists, occupational therapists, and other special education professionals. Children are eager to participate in the Heart of Benjamin activities because they are loved and cared for. Heart of Benjamin is their home away from home. Until recently these amazing afternoon programs functioned outdoors and in temporary mobile homes on the campus of the Ofra Regional High School. 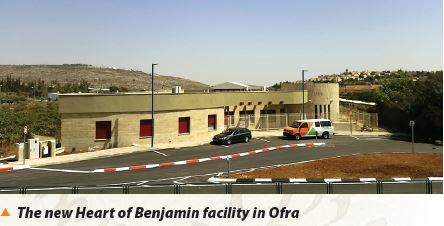 However, thanks to the amazing generosity of John Hagee Ministries, CFOIC Heartland has enabled Heart of Benjamin to complete a permanent facility in Ofra. Just a few weeks ago, Heart of Benjamin moved into its new home! The new facility is beautiful. It is wheelchair accessible, of course, and consists of two wings, a day care center for the activities and therapies that take place there on a regular basis, and a small dormitory facility to enable parents to leave their children overnight or on weekends as needed and on a rotational basis. The overnight wing is not yet ready and we are still working on helping them complete this section of the building, which will provide a vital addition to what Heart of Benjamin can offer families of special-needs children. Benjamin’s amazing holiday and summer camps. The children are particularly enthusiastic about the camps because it allows them to participate in exciting recreational activities which are structured to resemble the youth group activities of their peers and siblings. They get to go on outings and nature hikes, and visit children’s attractions such as amusement parks, zoos, and activity centers. If it were not for the staff and volunteers of Heart of Benjamin, these children would never be exposed to these amazing fun experiences. Aviva Ernst, the mother of Haya Mushka, a regular at Heart of Benjamin, admits, “Heart of Benjamin saved my sanity!” Caring for a special-needs child, especially during holiday breaks and summer vacation is a daunting, at times overwhelming, task. Parents like Aviva have reached out to us, to you, to say thank you for the break you gave them from caring for their special-needs child, giving them valuable hours to work, regroup, and recharge. CFOIC Heartland has succeeded in providing this support to Heart of Benjamin over the years because of you, our loyal donors and friends. Even the amazing generosity of John Hagee Ministries towards the building was made possible because of regular people, like you, who made a difference. Whether you donated a large sum or gave us that extra money you saved by forgoing something small, you joined a family of people who wanted to bring a smile to the faces of the children of Benjamin.